I know I'm not the first person to think of this. The idea of a Fancy Cleaning Schedule. But just bear with me, OK? Like many of you, I struggle with maintaining a clean home, happy Husband, well-adjusted Toddler, healthy Sheepdog and my sanity on a daily basis. This past February marked the second anniversary on the close of our home. Shortly thereafter we began renovations and necessary updates to the house while I was six months pregnant. Before we knew it, our life was turned upside down as we welcomed Baby C into the mix and any semblance of structure and organization in our lives went out the window. As a newly "unemployed" stay-at-home wife and mother I had a lot of adjusting to do those first few months and truth be told, I'm still adjusting. With every new milestone reached, a new "schedule" is created and the previous "schedule" is tweaked and shifted so that it fits with the days' needs. Pre-Fancy Cleaning Schedule, the thought of trying to keep our house clean intimidated the bajeezus out of me. Every day I would make excuses to myself and The Husband saying things like "well, I couldn't clean the bathrooms AND make dinner AND play with Carter AND blog AND vacuum the upstairs so something had to go." And usually that something was dinner. I hate to admit this but in the two years that have passed since closing on our home and the twenty months since we welcomed C, I've finally come to the realization that a "cleaning schedule" is precisely what I needed to keep that overwhelming "oh my god how am I going to get all this done today" feeling at bay. You see, I'm a list-maker at heart and I've always thrived on lists and schedules and it truly amazes me that it took this long for me to restructure our lives so that I could, in theory, "do it all." During the first trimester of Complete And Utter Exhaustion my second pregnancy, we entertained the thought of hiring a Cleaning Service to help out around the house. As tempting as that was, however, I had to think about how much I love having some extra "play" money at the end of each month to buy new clothes for C or M2 or even a new pair of these for Mama. Until I'm ready to forgo those simple extra luxuries, which looks like it may not be for a very, very long time, I am the "Cleaning Lady" and so today I thought I'd share with you just how I breakdown my "chores" each week so that I'm not curled up in a corner in the fetal position, stuffing my face with Cheese Puffs muttering a string of profanities. Here's what my personal "chore chart" looks like. I started with a list of the typical cleaning chores that are required to keep our household running smoothly and off the radar of TLC's hit show Hoarders. I then simply divvied them up into a schedule of sorts that didn't send me running for the Cheese Puffs. I also made sure to leave the weekend as just that. The Weekend. You see in the M household, there is no cleaning on the weekends. This, by far, has been my favorite adjustment. I cannot tell you how life-changing a simple "chore chart" has been for me. I'm sure many of you out there are saying, "Duh, AP. I can't believe you hadn't thought of this sooner" and believe me, Loyals, I had the same face-palm moment. This simple little chart has been laminated and stuck to our fridge for nearly three weeks now and each day I go at it with a dry erase marker checking off the tasks that have been completed for the day. It truly makes my List-Obsessed Heart squeal with joy and I no longer feel overwhelmed at the thought of trying to "do it all." Sure, there are still some nights that dinner isn't made but I'll let you in on a little secret, Loyals. As long as there's a clean kitchen and an empty sink? The Husband hardly notices. Now, if you'll excuse me, I have some hardwoods to go steam. While I don't have a fancy laminated chore chart I have written one down in my ec planner. You and C are cleaning machines, maybe he'll be trained by the time M2 gets here. Yes! A simple schedule makes it SO EASY - I wish I'd started using one sooner in motherhood :) I combine my chore chart with my To-Do list just to make sure I don't miss anything - and so I have proof for the Husband that I wasn't on the internet all day. Couldn't agree with you more!! 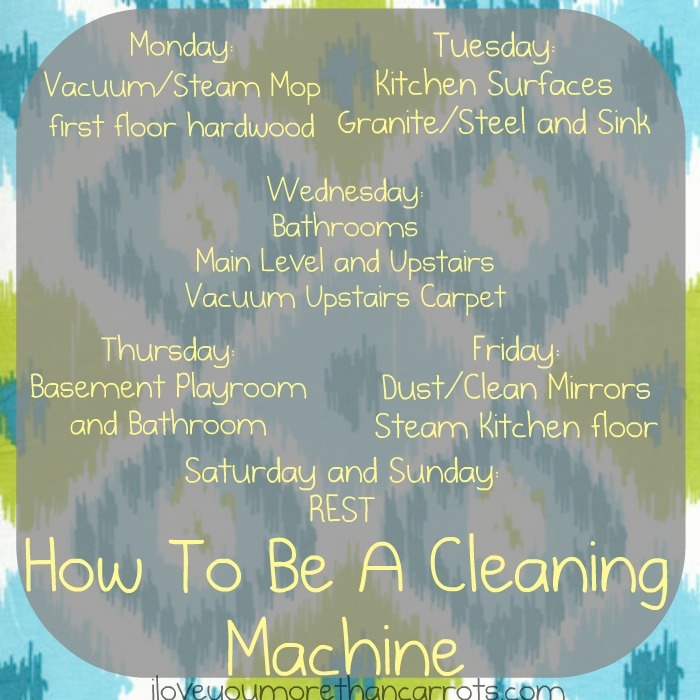 I posted about this in the summer or fall and said the same thing...my little personal "chore chart" changed my life! It makes it much less overwhelming. Very impressive! I really should make a list for this myself. Although it warmed my heart to see dear, sweet Boyfriend cleaning the bathrooms this weekend. He even scrubbed the floors. I love him. Although I felt bad for not doing it myself this week. A little bit. I never thought it'd be so helpful to make a silly chart too! I don't have a toddler yet, but I hope to stick with it and hopefully won't be so overwhelmed. Cleaning a big house is daunting!! The Happy Housewives book really helped me hahaha. Your schedule is a lot like mine and I consult it weekly--write it in the EC planner and I feel so much better. Do you like those steam mops? I don't have one yet...worth it? Props to you girl!! I love this.... I might just have to make one too. Like you, my heart is happy when I have a list and even more so when things are marked off that list (okay, well not marked off because that junks up my pretty list --- but AS they are marked off my heart swoons). Do tell friend, how do you work in laundry? A little each day? I HATE laundry. Hate it! And yes, isn't this whole thing an adjustment...figuring out how to get everything done in a day? I've decided to just chill out a bit because I never, ever got everything done on my "to do" list at work, so why would it at home? I was always putting out fires and adding to said list instead of really accomplishing anything from the original one! Okay, I'm rambling. Happy Monday to you, C and sweet baby boy on the way! Wahoo! You posted this! Thanks so much! i have a "chore chart" as well. Mine is on a white board, so I can change things around if I wanted to. When we were childless, it was no big deal...I could crank out the cleaning and laundry in record time on a Saturday or Sunday...now, with a 2 1/2 year old and the fact that I work, commute 2 hours round trip, and try to make dinner and spend a little QT with my sweet T before bath and bedtime, I finally gave up the guilt of the cleaning lady we have every other Thursday. Yes, I still have to do cleaning in between her visits, but don't beat myself up like I once did. I try to pick one task a night that I can do quickly (i.e. under 30 minutes, preferably 15). But I put it on a list each week as well, so I have the satisfaction of crossing it off. And yes, I'd rather have some extra $$ at the end of the month for me and T rather than giving it to the cleaning lady, but it does allow for me to have more time on the weekend for fun with my little one. (Sadly, I've given up my every other week professional manicures instead! The horror!) And when I came home on Thursday night to see that all the shelves in my fridge cleaned and organized without me asking, totally worth the $$ every 2 weeks to have a happy mommy. But if I was a SAHM, I would be cleaning lady free and following your chart AP! Love the weekends "cleaning free!" especially! Okay, seriously... WHY have I not done this already!? GENIUS! I need to do this... PRONTO! I have a Little Man due in exactly 1 week and will NEED a cleaning schedule. Thank for the inspiration!